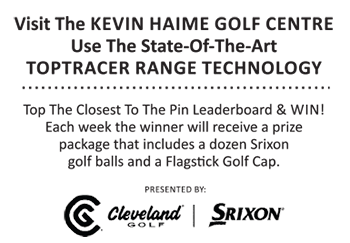 [CORAL SPRINGS, FLA. via PGA of Canada]—To say Scott Allred has been seriously close to winning a PGA of Canada national championship in the recent past might be a colossal understatement. His record over the past six years speaks for itself. In 2011 he finished runner-up at both the PGA Club Professional Championship of Canada and PGA Seniors’ Championship of Canada. Two years later he finished third at the PGA Seniors’ Championship of Canada. 2014 again saw him finish second at the PGA Club Professional Championship, while in 2015 he finished fourth at the PGA Seniors’ Championship of Canada and fifth at the PGA Championship of Canada. Earlier this summer he finished fourth at the PGA Seniors’ Championship of Canada. Now the executive professional at Elbow Springs Golf Club in Alberta leads the PGA Club Professional Championship of Canada presented by Titleist & FootJoy heading into tomorrow’s final round. The 56-year-old posted an opening-round 2-under-par 70 Tuesday at TPC Eagle Trace in Coral Springs, Fla., and leads by a shot over an impressive list of names. The group at 1-under includes the legendary Gar Hamilton, winner of four PGA Club Professional Championship of Canada titles; Gord Percy and Dan McNeely of the PGA of Canada – Ottawa Valley Zone; Ontario’s Gord Burns and Brian Hadley. John Cochrane, Scott Dickson, Marc Girouard, and Philippe Mongeau are two-shots back at even-par. Twenty-four players are within five shots of the lead heading into the final round. Allred, Hamilton and Percy, who were paired together in the first round, will form the championship’s final pairing at TPC Eagle Trace. Allred admitted playing poorly in the practice round but turned it around for the first round. The Inter-Zone Team Championship, which is comprised of four players per zone (and three scores per team counting), is also handed out at the end of play Wednesday. Team Ontario—which features Burns, Hadley, Billy Walsh and Ken Tarling—leads at 1-under-par, 12 shots better than Team British Columbia and Team Quebec.